Sprawling golden sands, noises made by rippling waves when they hit the shores, rocky hillocks are the few of the spectacular views which will entice the tourists who visit Rushikonda Beach. Moreover one can see rows of mango trees and palm grooves on the shore of this beach. Rushi konda beach is the most popular beach near Vizag and also one of the most beautiful beaches in the region. 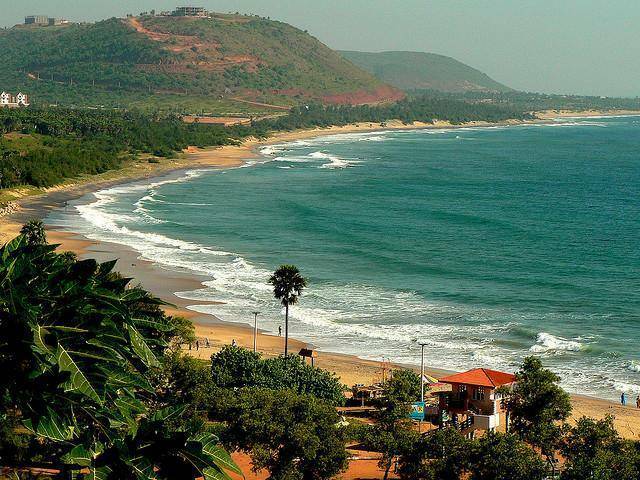 Rushikonda beach is located 8 kilometres from Visakhapatnam. Rishikonda beach also provides water sports activities for adventure lovers. Swimming, surfing, skiing etc are the water sports organized here. Andhra Pradesh Tourism Development maintains a tourism complex with decent beach cottages at reasonable rates, restaurant and other facilities. Rishikonda Beach is also the location for ISKCON Temple in Vishakhapatnam. Haritha Beach Resort operated by Andhra Pradesh Tourism Department Corporation (APTDC) is one of the accommodation options on the beach.